For utilities, the program automatically assigns the names UTIL-1, UTIL-2, UTIL-3, and so on. The bus the utility connects to, which must already exist on the one-line. For reference, the To Bus base kV is displayed next to the bus name. Utility operating kV for calculation of per-unit impedance. This does not affect the power flow controlled voltage. See the Fault Duty Unit table below for more information. 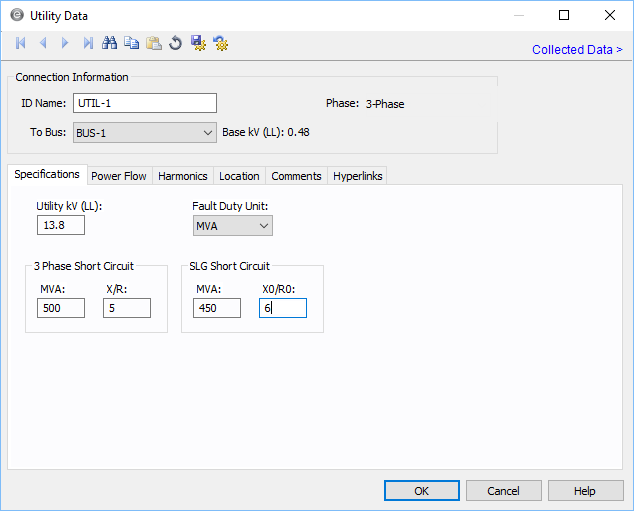 Utility MVA Base When Zpu is selected as the fault duty unit, you also need to specify the MVA Base of the utility for the per unit values. Used in determining short circuit reactance and resistance values for 3-phase faults and line-to-line faults. Used in determining short circuit reactance and resistance values for single line-to-ground faults. kV DC Utility operating kV. If this value is different than the bus base kV, then the controlled voltage is scaled appropriately. Fault Duty Expected fault value (in amperes) or the Thevenin equivalent resistance (in ohms) at the DC utility connection point. Utility bus type used in modeling the power flow simulation. When you choose a particular model, those fields which do not apply become unavailable. A utility is normally modeled as the reference or swing bus, but may be modeled as another generator bus. See Swing Sources for more information. Swing - A swing bus holds the bus voltage and angle constant. There cannot be limits on the amount of MW or MVAR the swing machine can accept or provide. PV - Constant power, constant voltage utility. This is also known as a regulated utility. This model tries to hold a user-specified bus voltage within utility MVAR limits. PQG - Constant power, constant var utility. This is also known as an unregulated utility. This model holds the MVAR generation within given voltage limits. MW Utility output MW. This may be actual operating or a rated value. This applies only to a PV or PQG utility. MVAR Utility output MVAR. This is only used when the utility is a constant power, constant var (PQG) machine, or when a PV utility MVAR limit has been reached and the machine automatically switches to PQG. MVAR Limits Minimum and maximum MVAR limits for regulated utilities (PV). The utility will switch to type PQG if these limits are violated. If there is only one swing utility (Model = Swing) on a bus, it should not have any MVAR limits. If there is more than one swing utility on a bus, at least one of them must be unlimited. Ctl kV PU Desired control voltage for a regulated utility (PV). The utility will try to control the voltage at the controlled bus to a given value. If the utility bus is the swing bus, this voltage serves as the reference voltage. The voltage is entered in per-unit. Ctl Angle Controlled angle is used only when a utility is designated as a swing bus. The value is entered in degrees. Ctrl Bus For a PV utility (regulated), the bus that is to be controlled to the control voltage. If this field is blank in the database, EasyPower fills it in with the name of the bus listed in the To Bus field. (This does not take effect until you click OK to close the database dialog box.) This field is ignored if the Model field is set to Swing. Swing (Regulated): Holds the utility bus voltage at specified per unit value (Ctrl kV PU). Swing (Un-Regulated): The utility bus voltage drops with the increase of load current based on Thevenin impedance. Constant Power: Outputs the specified amount of kW (Output kW). Table Values in When the frequency response of the utility is specified in the table (spreadsheet), the impedance can be in per-unit of a specified MVA or in Ohms. 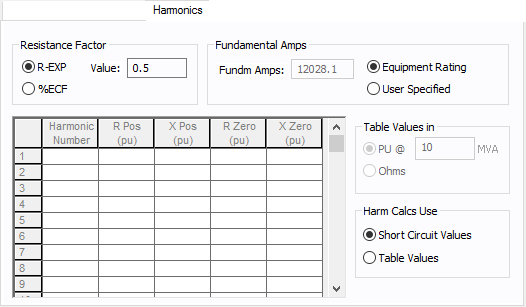 Harm Calcs Use The utility response to harmonics can be based on the impedance calculated from short circuit values in the Specifications tab or based on the table. Harmonic Table If Tables Values is selected for Harm Calcs Use, then this table is available. For each harmonic number you can enter the impedances: R Pos, X Pos, R Zero and X Zero. For each harmonic number entered in the spreadsheet the row must be complete with data. The harmonic may be integer or non-integer.